Get great tasting, healthy water for just pennies per gallon! 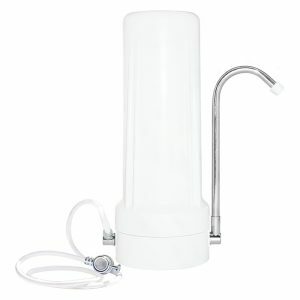 Enviro Products’ patented 10 Stage Plus Water Filter delivers chlorine-free, odorless, great-tasting water at your kitchen sink. The space-saving, attractive countertop filter installs easily in seconds to any standard faucet* and allows you to easily change between tap water and filtered water as needed. Filters: chlorine, trihalomethanes, organic arsenic and inorganic arsenic, mercury, lead, PCBs, floating solids, asbestos, pesticides, and herbicides. Save money! Average cost is 8 cents per gallon after purchasing the system and 5 cents per gallon after replacing the cartridge. Lasts 1 year on average for a family of 4. Complimentary filter change reminder service. 4 lbs. 1.6 oz. 5.3 in. 4.5 in. 12 in. © 2019 New Wave Enviro.